Located in the Trump International Hotel on Saratoga Road, is BLT Steak. My cousin and I took his mom out for dinner for her birthday. The menu sounds yummy so we thought we'd try it. My personal trainer and one other person said it's great food so definitely worth checking out. A big warm hug in the form of a bread, served with butter and rock salt (I did without the salt). Much, much better than Mariposa at Neiman Marcus. Cold popovers is dirtying a plate just to dirty it. If you checked out the link for BLT Steak at the top, you'll notice they have a simple, but complete menu. Complete meaning if you wanted fish, they have it, steak, etc. They also had a prix fixe menu which had an appetizer, entree, side and dessert for $60. My aunt and I chose this while my cousin chose the wagyu. I got the iceberg lettuce wedge with blue cheese. I should have written it down or taken the menu, the prix fixe choices aren't on the web menu. It was very nice! The blue cheese was strong, but Aunty had warned me that brand was. I kind of had to fight with the lettuce to get it on the fork (not sure if it was me (too tired), the iceberg lettuce (too flat?) or the probably very expensive fork (not pointy enough?)) so I gave up 2/3 of the way through it. It had bacon, radishes, grape tomatoes and a faintly ranch tasting dressing. On the right is Aunty's appetizer off the prix fixe menu, clams. WOW, they were good, lightly seasoned so you could still taste the clams but very flavorful. On the left is cousin's appetizer: BACON. Yup, three giant, thick slices of bacon with some sort of green pesto or chimichurri sauce. And here's where it starts to go downhill. The green sauce was extremely salty. I figured it out because my salad had some plain bacon and it was just fine, if a bit tough. Then came the entrees. Cousin's wagyu came sliced with more green sauce. My 14 oz ribeye (this was the only steak choice on the prix fixe menu, I wasn't that hungry) came with a hoisin type sauce and little potatoes on the side. Aunty got the scallops with some little crab wontons. For sides, we had hen of the woods (maitake) mushrooms, polenta topped with bacon and mushrooms, potato gratin (chunks of potatoes with different cheeses) and spicy barbeque corn. The white disc is an herbed butter with rock salt. Our steaks were more medium rare than medium, but that's okay. My ribeye was actually tough and chewy. Every entree was salty. Very, very salty. I came away feeling like I had eaten a ton of MSG (I sorely hope they don't put MSG in their food), but the chef doing the sauces was extremely heavy handed with the salt. We came away with 50% of our food in doggy bags because of the salt. Dessert was a nice non-salty end to the meal. We got profiteroles (what is that? was it called that? I forget, but that's what I'm calling them until I am corrected), WARM YUMMY CHOCOLATE CHIP COOKIE DELICIOUSNESS!!!! There is a reason this blog is called less than three cookies because I heart cookies. I immediately shoved the whole thing in my mouth, which may have been a really bad thing if it wasn't so good. He didn't share, but he quietly snarfed the whole thing. He said he couldn't taste the banana in the ice cream until the last bite. Yes, I picked out all the raisins. It was a little rich with the glob of caramel at the bottom but I did my best. I don't really like tart, I'm a chocolate girl. This was "okay" but more sweet than tart. I tried a dragon fruit, it tasted like watery watermelon with kiwi seeds. This is NOT a fruit to eat on a date. All those little seeds ended up in my teeth. Ick. I am still undecided if I will go back. I think I will, but at about $100/head without alcohol, it's a little steep for a salt lick. I may go for a special occasion and ask for low salt and see what happens. 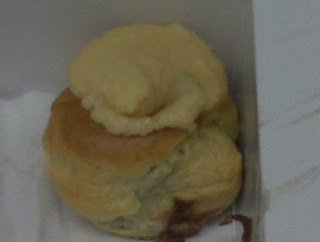 The awesome service, popovers and profiteroles are enough to make me want to definitely try the bar/lounge area out. If you go, I hope you have the wonderful experience my trainer did. Aren't profiteroles cousin to cream puffs?